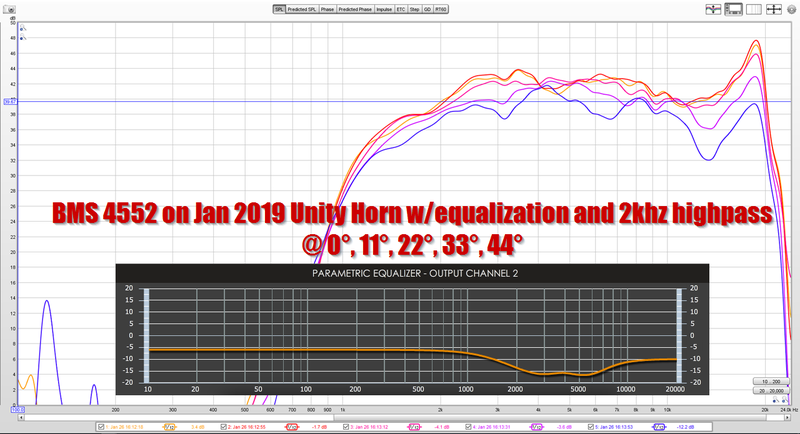 I believe the primary advantage of a Synergy Horn over a Lambda Unity Horn is that the Synergy xover includes some little-discussed features that aren't in the Unity horn. (It's in the patent, hint hint.) Also, if I'm correct about the Lambda Unity Horn, then there's real potential to turn it into a world-beater by revising the crossover while using the same drivers that it came with. The Unity horn concept came a long way between the premier of the Lambda Unity horn in Y2K and nowadays. To anyone here that wants to know more about the SH-50 passive crossover, just ask. I'll do my best to answer your questions. I think the treble of the Waslo designs is superior to the Danley designs, but the Danley's image a little bit better. I think the reason the treble on the Danleys is a little rough is because the midrange taps are significantly larger than the Waslo designs, and I think that's impacting the treble. Danley doesn't really have a choice here; he's selling a high-output design and if the midrange taps were smaller it would limit the output. Possibly the weirdest thing about the SH50 is that it's really difficult to perceive where the soundstage begins and ends. 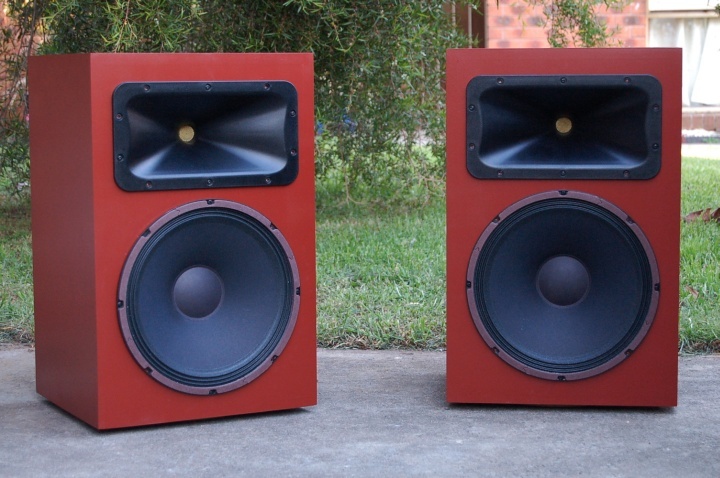 I've never heard a speaker like that. I've told this story a million times, but when our twelve year old daughter was sitting THREE FEET away from a Danley SH50, she asked "is it on?" Like, how crazy is that? She's sitting mere inches from a giant loudspeaker cranking out something like 100dB in SPL, and she can't tell if it's on or not. Danley has related similar stories, about how you can stick your entire head in an SH50 and it's difficult to perceive where the sound is coming from. Crazy stuff. I think this effect is caused by two things. First, the crossover. Second, the midrange taps in the Danley products are *much* further down the horn than in the Cosyne. In the Cosyne, it's two inches, in the SH50, it's 3.5". In the Small Syns, it appears to be about 1.75"
So you have this situation where the wavefront that's produced is in-phase, but the *sources* of that sound are radiating from three points in space separated by almost a FOOT in depth. If you feel the SH-50 disappears into the room, then you should hear a pair of Jubilees (well set-up). The effect that you mention is heightened even further than the SH-50 in my experience. My border collies sleep on their dog beds in front of the Jubs and K-402-MEH. The sound is still "diffuse" even though you put your head into the mouth of the K-402-MEH. I'd love to hear those. I've heard so much abut Jubilees, but I've never seen one. I'm going to do a repost from another thread of mine. Basically I'd been trying to build a Unity horn with a super-narrow baffle for the past few months. Then I bought the Bill Waslo Cosynes. Now that I've done that, I am really liking the 'cornerhorn' thing. For comparison's sake, here's the horizontal polars of a Pyle PH612, which is a clone of a JBL PT waveguide. 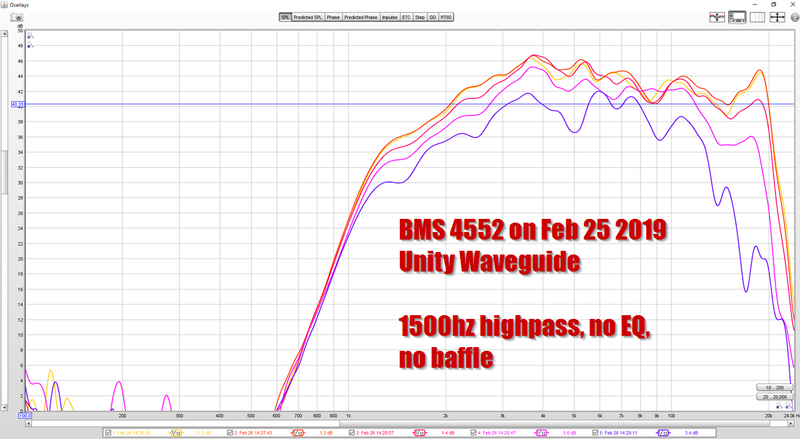 1) my waveguide is a Unity horn, and it will easily play down to 500Hz once I add the midranges. Try doing THAT with a JBL PT waveguide. Here's a measurement of my new waveguide. 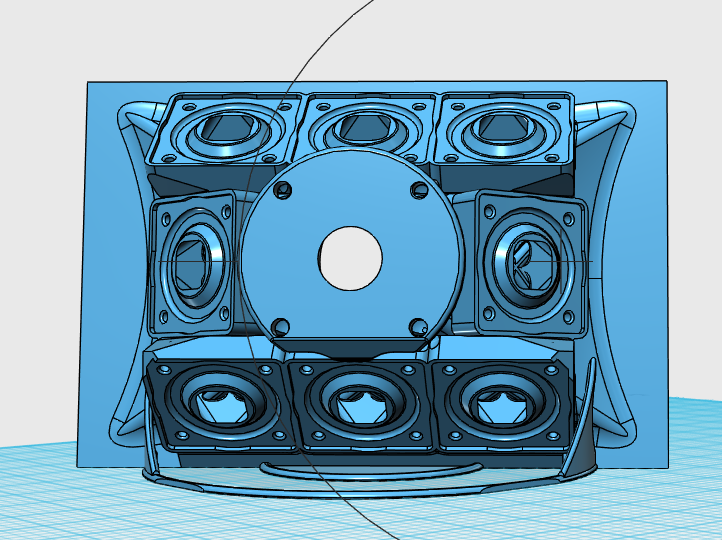 This is admittedly rough; it's nowhere near as nice as the JBL PT waveguide. But in my defense, the waveguide is completely unbaffled, the mids aren't installed, and I made no effort to cover up the midrange taps. I think that once I do that, it will be smoother. And my measurement includes no equalization; the PH612 measurement pictured above DOES include EQ. I wasn't thrilled with the response in post 284, so I thought I'd see if I could improve it. I couldn't figure out if the 'lumpiness' in the response is from the compression driver, from the waveguide, from the fact that it's unbaffled, or all of the above. 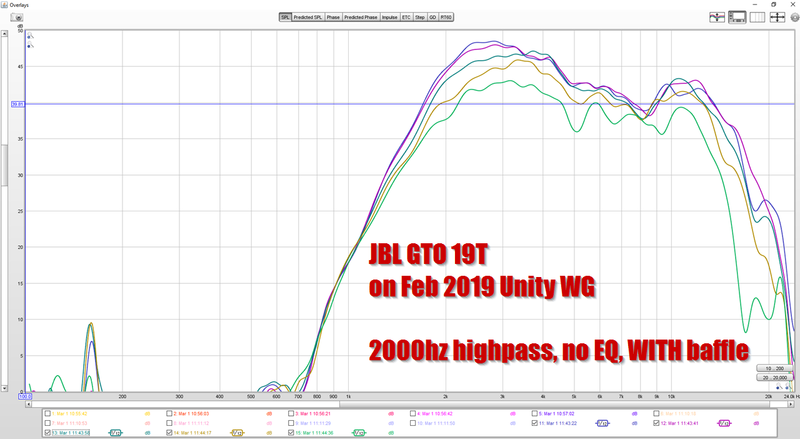 Here's the response of a JBL GTO 19T on the Unity Waveguide that I made last month. 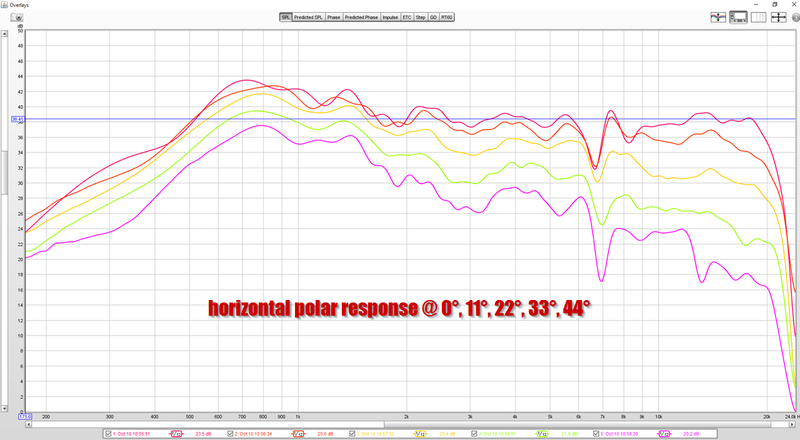 Using a dome instead of a compression driver DID improve the polars, particularly off-axis. So I took the same waveguide, and I added a baffle. I was hoping that would smooth things out. Nope, actually made it a little worse. 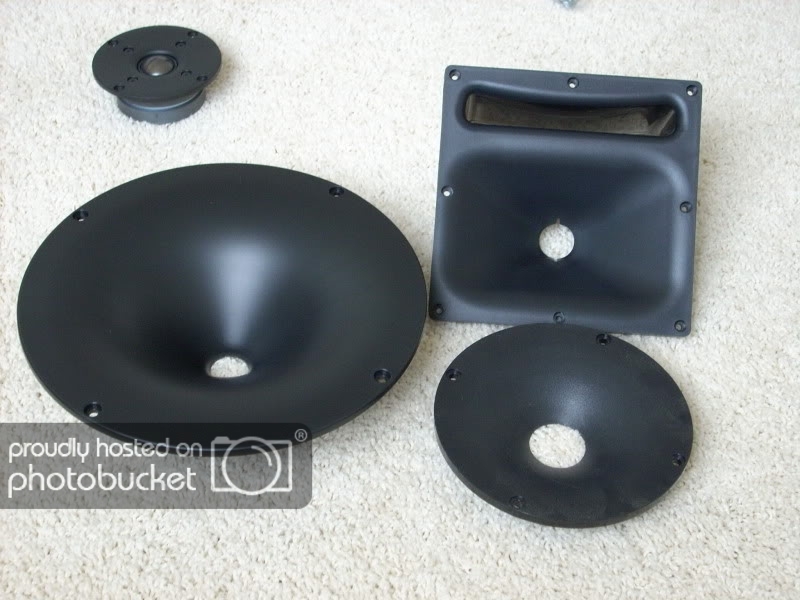 The baffle DOES increase output below 4khz, because the tweeter is now radiating into half-space instead of the sound wrapping around the unbaffled waveguide. But still, the performance isn't great. 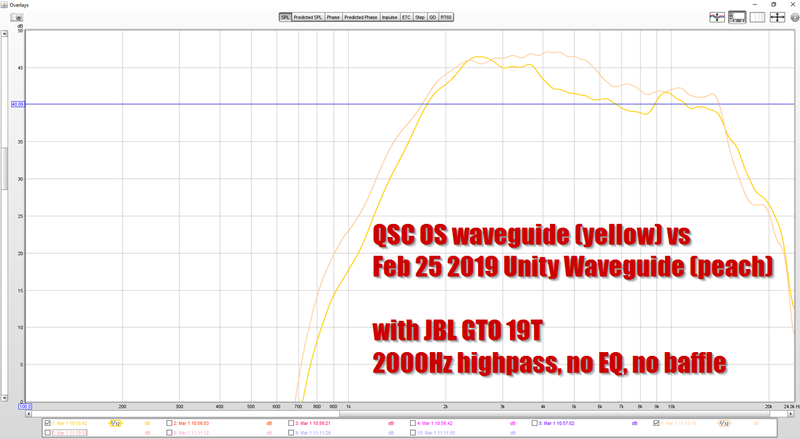 To see if the problem is the waveguide, I put the JBL GTO19T on a QSC OS waveguide. Looks like I may have found the problem lol. The QSC just blows my waveguide out of the water. Really great performance here. In the waveguide photo above, the QSC is on the bottom left. I stole the pic from augerpro. 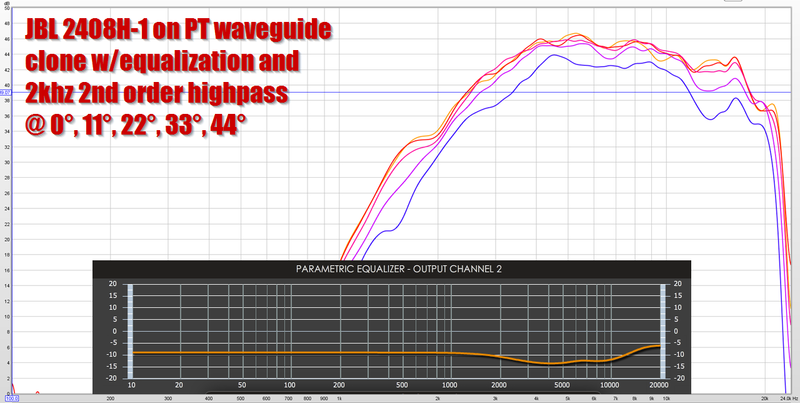 Here's a comparison of MY waveguide versus the QSC waveguide. 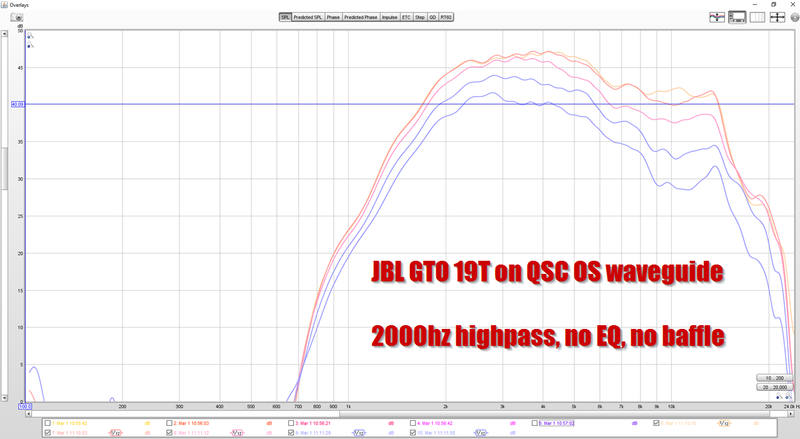 The QSC isn't just smoother, it's louder. On the downside, the beamwidth of the QSC is narrower, it's almost exactly 90 degrees. 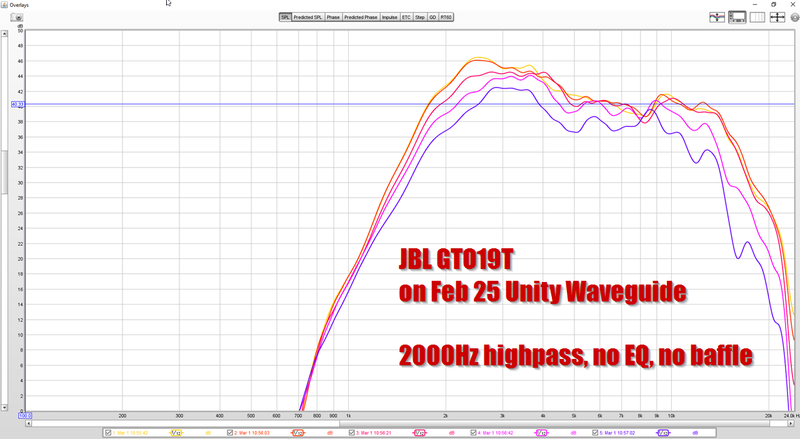 One 'gripe' that I had with the JBL tweeter is that the output drops like a rock at 14khz. 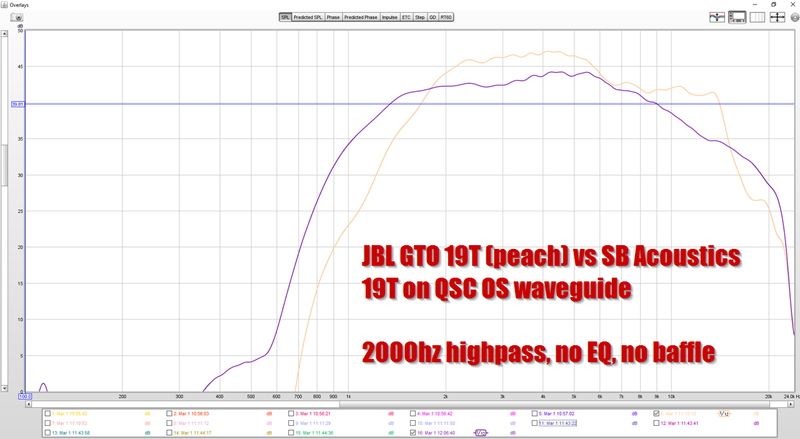 Here's a comparison of the SB Acoustics 19T vs the JBL 19T. You can see that the SB acoustics has a lower 'Q' due to a larger back chamber. The SB rolls off much more gradually. All in all, I'd say the SB wins. It's too bad that the JBL doesn't work better, because it fits *perfect* on waveguides and horns, it looks like it was made to be horn loaded. 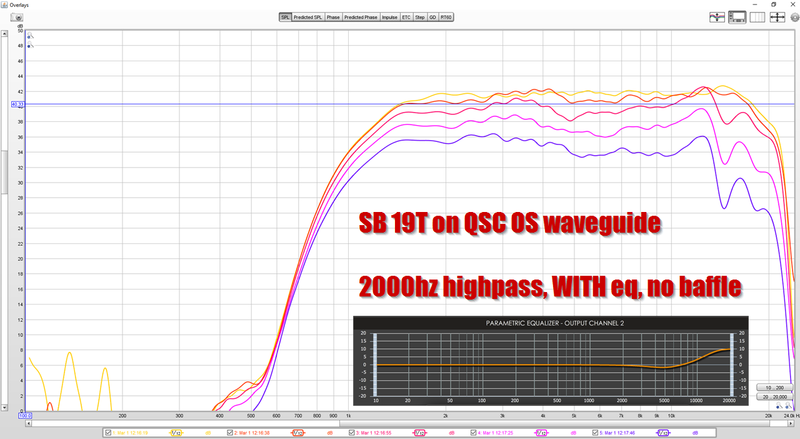 Here's the response of the SB Acoustics 19T on the QSC OS waveguide. This is just bonkers performance IMHO. This might be the best measuring waveguide I've ever seen. 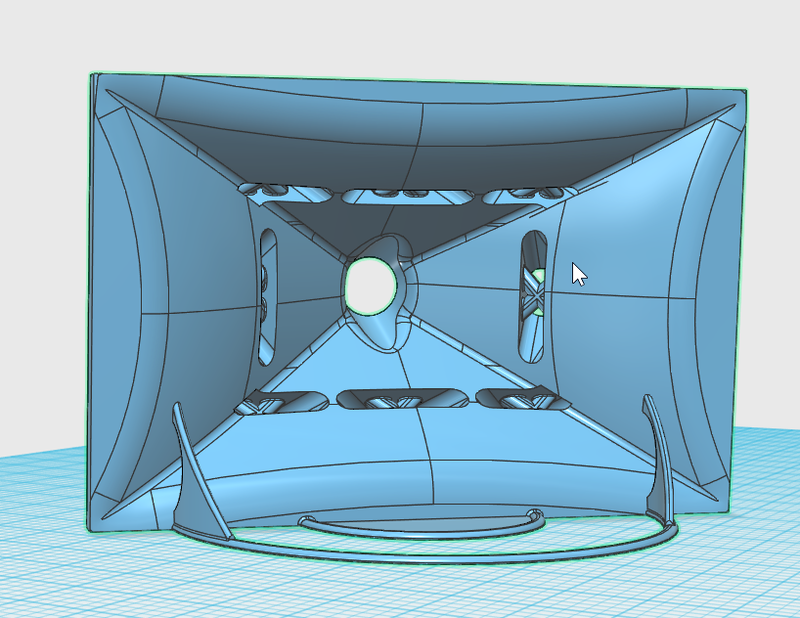 It's crazy how uniform the curves are, on AND off axis. And this waveguide is symmetrical, so it should sound great everywhere in the room. Another 'interesting' thing is that it just sounded 'cleaner' than the BMS when I was doing my sweeps. I know that it's challenging to measure higher order modes, but I definitely wonder if there's some in the BMS. Particularly since the BMS response is lumpier, and there's a 90 degree bend in the compression driver. Makes me wonder if the 'lumps' in the response are caused by reflections back down the throat. All in all, spectacular performance from the QSC / SB combo. Total cost is under $40 per side!